so, I shoot a dot on my wad gun as well as my conversion. I need to start getting the irons in the game however my vision is having no part of it. I have a set of Champions style glasses that are pretty much like knoblockes (sp). I can get a lens that gives me a real good front sight post but here’s the rub. When wearing them I can no longer see anything close..like stuff in my range box, the port of my pistol etc. so, is there a way to put a second lens on it to see close! Again, I like the lens and it even helps with th dot a bit but I’m otherwise blind as a bat anything closer then my front sight. I also like to wear a blinder on my non shooting eye. 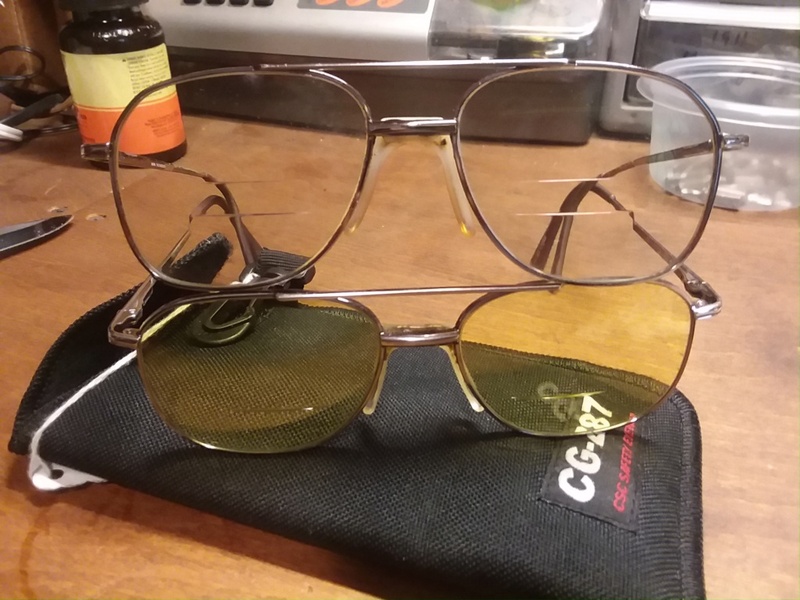 I had my optician put a bifocal on my shooting glass lenses. I use Randolf Rangers for shooting glasses frames. These are popular in shotgun shooting. From there he grinds the lenses per to afford me clear focus on my from sight. I add the bifocals and a blue blocker coating to ease eye fatigue. Finally, I bought a couple high quality clip on lenses, purple for really bright days and an amber shade to add all aid my eyesight on dark days. The above wasn't cheap but with care will outlast me. I sorta went gung ho. I needed a good pair dedicated to shoot steel sights and I also wanted to wear a pair every day that would work for steel. Think CC. I tried progressives but was never able too get them to work with a dot. I ended up getting tri-focals for every day. My optometrist set the middle lens to focus perfectly on the front sight. It also works for the dash in the rig. The upper lens works for far vision and lets me see dot as a circle. The lower lens is for reading. I added the ability to change shades and had a perfect set for most matches. The EIC, DR match glasses were easy once I had those other prescriptions. I started with tinted safety glasses and played with both lenses. For the right eye all I have is the lens that works for the front sight and the reading lens for the bi-focal. In the left eye all I have is the distance lens and the reading lens again as the bifocal. It sounds complicated but once I put them on they work pretty much like the trifocals but I have much more useable lens for my flip down sight aperture. Takes a couple of minutes and I forget they are on. When I had my glasses done, I had my right eye corrected to see the front sight and there is no correction in the left lens. I could have gone with a bifocal set so I can see up close for sight adjustments but I didn’t need it. He does last appointment of the day for firearms glasses. Bring your gun in and he takes the measurements. I use Decot Revel left lense for front sights, right lense distance. a reader in the lenses would be a nice touch though. I use clip on flip up lens. My regular eyeglasses lens, plus the prescribed flip up lens (that your doctor will match up) will give "mid range" vision on the aiming eye. The non aiming lens is plain old plastic with no correction. Flip them up while loading mags, scoring targets etc. Flip them down while shooting. IMHO, you need a quality lens with proper power and astigmatism (if needed it is crucial and even more important for dot sights). It's best to measure the distance from eye to front sight then take that measure to optometrist and use fine print to get a more accurate reading. Have a low bifocal cut into the lens for scoring if you want but I just switch glasses for that. Now if you need to sharpen up the rear sight and target some as I do get a Merit aperture eyepiece. I'm sure the flip up and lens color can also aid your vision but the best thing I did was really make sure I have crisp vision when the doc is adjusting the optowhateverscope. your paying him so make him work for it.